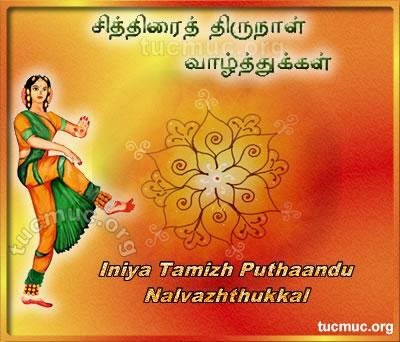 Puthandu more frequently known as the Tamil New Year n the Southern Indian states of Tamil Nadu. They generally fall on 13 April or 14 April. The Tamil New Year is celebrated on the first day of the Hindu Solar Calendar. Every year in the month of Chithrai (the first month of the Hindu solar calendar), in the temple city of Madurai, the Chithrai Thiruvizha is celebrated in the Meenakshi Temple. A huge exhibition is also held, called Chithrai Porutkaatchi. The day is marked with a feast in Hindu homes and entrances to the houses are decorated elaborately with kolams.